Properties in Boô-Silhen average 4.5 out of 5 stars. Five of us stayed in this apartment in September. The downtown-adjacent location is extremely handy and convenient for walking to restaurants and shops. It is quite large and there was plenty of room for all of us. Parking was right outside the door, which was excellent. Having two bathrooms was handy, although the layout was a little strange. Lots of window for light and a view of the mountains. This is the only apartment or house we have ever stayed in - Europe or the US - where we had to rent the sheets and towels . . . kind of weird. (Also, the bath towel we &quot;rented&quot; was the size of a hand towel!). The supplies were kind of skimpy - we had to ask for toilet paper and dishwasher soap. On the flip side, the host was located nearly and amazingly responsive and helpful. She was really great with helping us decide on what hikes to take, and how to get there. Cauterets is everything we wanted. The mountains are beautiful, the town is small and easy to get to and get around, and it isn't horribly expensive. The ski area of Le Lys was perfect for us beginners. The day before our arrival the owners emailed and called me to say the boiler had broken and that it would not be repaired by the following day (it was Christmas). They booked us into another apartment through the agency and it was very comfortable and actually larger than their own. 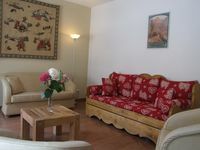 Therefore I cannot review the apartment but I can say that the owners, Sylvie and Marc, were very good at communicating with us and dealt with the problem swiftly and effectively so that it did not impact us at all. A word of advice: indeed as in the listing, towels and bedsheets are not provided. We had to rent them from the agency and it was very expensive (&euro;20 for a pair of sheets and a towel). Pillows and duvets were in the apartment, but the agency didn't even have pillowcases or duvet covers. We had to use t-shirts to cover the pillows and the agency didn't seem to understand our frustration.